Poinsettias are synonymous with the holiday season here in New York City. Scott's Flowers decided to investigate why this tropical plant became so popular during the days surrounding Christmas. 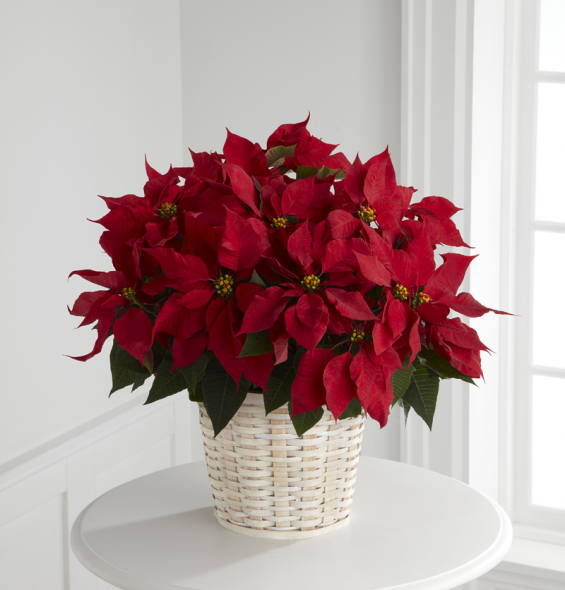 Originally, Poinsettias come from an area in Southern Mexico known as 'Taxco del Alarcon' which where they flower during the winter. Originally used by the Aztecs, this plant was both decorative and practical, being used in a wide range of ancient medicines and dyes. Eventually, Joel Roberts Poinsett brought the plant to his green houses in South Carolina where he sold the vibrant plant to local florists in 1825. But how did the Poinsettia became associated with Christmas? This story brings to light a legend of a poor Mexican girl that resulted in a miracle. There was once a poor Mexican girl named Pepita who placed a bouquet of weeds next to a nativity scene, and then the weeds burst into bright red flowers. Everyone who saw this was sure they had seen a miracle. From that day on, the bright red flowers were known as the 'Flores de Noche Buena', or 'Flowers of the Holy Night'. Further meaning behind this magical plant suggests that the shape of the poinsettia flower and leaves are thought as a symbol of the Star of Bethlehem. The red colored leaves symbolize the blood of Christ. The white leaves represent his purity. Make sure to pick up this mystical Christmas plant from Scott's Flowers for your home during the holidays. Call 1.800.726.8874 today!